Click on the links below to find information on our New and On-going monthly Clubs. Take a Stroll in the Park! This block of the month (BOM) program features 8 unique blocks all created with the Sidekick & Hex N More rulers from Jaybird. With the help of Kate, this 9 month BOM will be a cake-walk! Hexagons, triangles, half-hexies and jewels will be easily mastered and with no pesky Y seams! Escape with TQT in our next Book Club BOM series! 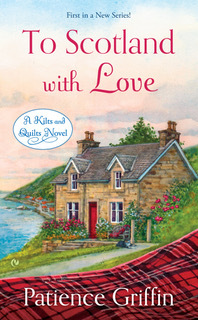 Leave Chicago behind and travel to Scotland in a series of delightful books by Patience Griffin all while creating a beautiful sampler quilt. Meetings will take place the 2nd Sunday of the month with first meeting taking place on February 10th. Register for the BOM. There is a $49 commitment fee. Click here to register online. Books are available to purchase at Bookie’s, our favorite local bookshop just up the street. Mention you are part of the Book Club and receive a discount on your book. The BOM meets on the 2nd Sunday of each month at 2:00pm. Learn how to make each block, then participate in a fun discussion of each book. Each month, there will be a kit fee of $24.95. The kit will contain fabric for both a 12” and a 6” version of each block. We will have a "wrap" party to share finished quilts.